Don’t Wait Until the Last Minute to Get the Marriage License! 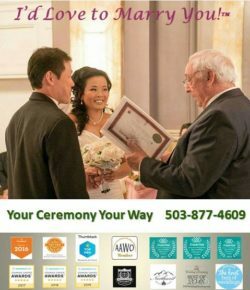 In Multnomah County, you’ll get this pretty, but unofficial, certificate when your marriage license is issued. If you want official proof of your marriage, you must request and pay for certified copies of the completed marriage license. Did you know that you must normally wait three days from the date your marriage license is issued in Oregon to get married? Or that Multnomah County will waive the three-day waiting period for an extra $5.00? You must intend to have a ceremony within the three days before they can issue the waiver. It’s better to get the marriage license at least a week — or even a month — before the scheduled wedding date. The license is valid for 60 days following its date of issue so earlier is better than later. The last thing you want to do is wait until 1-2 days before the wedding to get it and find out at that moment that you can’t get legally married on your wedding day! Multnomah County will waive the three-day waiting period for an extra $5.00 but then you must get married within three days of the license issue date. In Clackamas County, upon request, and at the time the license is issued, the three day waiting period can be waived. The waiver fee is an additional $15.00 payable in cash, certified check or money order. Check with your County Registrar, County Recorder or other Vital Records department for the requirements in your residence area. Washington law requires a three (3) day waiting period beginning the day you complete your application and make payment. The three day waiting period cannot be waived. You may not get married during this time. The license is valid for 60 days following the three-day waiting period. Please feel free to share this information with anyone who may be planning to get married. You don’t want them to be disappointed. And I’d love to have your comments on the usefulness of this post. Thanks for reading!